NDJ Series Viscosity Meteris a digital display viscosity meter by adopting the highsubsection driven step-motor and 16 bit micro-computer controlledprocessor with a LCD night visual display. The said meter is stableand accurate in motion, definitude in key demonstration,programmable in design, easy for operation. The display directlydemonstrates the viscosity, rotating speed, rotor number and themaximum viscosity measured for the rotor selected for the currentrotating speed. The main controlling board, subsection driven boardare all manufactured by adopting the Surface Mount Technology (SMT). The circuit is adopted by the micro processor that is most advance at present, with compact and reasonable structure. The RS232 is provided. The space for printing can be set up by the user. The full range and linearity at points are adjusted by PC interface . Its performance and functions have reached to the advanced level compared with the similar product in other countries. SNB Series Viscosity Meteris a updated product based on NDJ Series Viscosity Meter .Inaddition to the performance and features of the NDJ SeriesViscosity Meter, SNB Series Viscosity Meter is measured in a widerange because its rotating speed has changed into full steplessshift gear and the data can be collected automatically through PCport. The automatic operation, saving data and data contrast andstatistical analysis can be done by connecting to thecomputer. 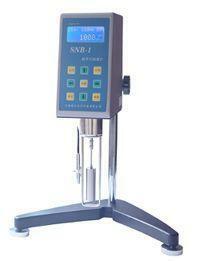 NDJ Series and SNB SeriesViscosity Meter are used in checking the viscous resistance anddynamical viscosity of liquid. It is widely used in measuring theviscosity of various liquid such as grease, painting,foodstuff, dope, paper making, cosmetics, chemical industry,capsule stickiness agent and medicines. As shown in the picture, The pointerof the load cell driven by the high subsection driven step-motor isdriving the rotor to go round and round through the hairspring androtating axis. If the rotor is not resisted by the liquid, thepointer of the hairspring load cell is in the same position withthe pointer of the load cell for the step-motor. On contrary, ifthe rotor is being resisted by viscous liquid, the hairspringproduces the wresting square and repel and balance with the viscousresistance for reaching the balance at large. At this moment, bytransmitting the output signal by the photoelectrical load cell to16 bit micro processor for data processing, the viscous value(mPa·s) will be displayed on LCD screen with the night visualfunction. (2) put the ascending and failing rack into the hole of the socket andkeep the opening direction of the socket and the upper rack of theascending and failing rack facing the operator and then screw downthe nut M12 with the spanner. (3) By running the knob of the ascending and failing rack, check theagility and self-locking capacity of the collet of the ascendingand failing rack. If loosing and tightening are found, you canadjust the bolt M4 on the back of the ascending and failing rackwith the screw driver to make sure that it can be ascended andfallen. It will be better if it is screwed down more less tightenedso as to prevent the viscosity meter from its going down afterinstalled. (4) Install the viscosity meter on the ascending and failing rack andmake it tighten with the bolt. The bolt that is unscrewed under theapparatus and remove and place the cap in yellow properly for nextuse. The cap in yellow plays a role in preventing the joint screw.It should cover the cap in yellow if it is not used for a longertime or being transported. (5) By adjusting 2 leveling feet to make sure that the bubble is in themiddle position of the viscosity meter on the top. (6) Please install it to the interface if KTD temperature probe isavailable. The printer is installed on the interface RS232 ifany. (7) To make sure the viscosity meter is on OFF and then turn iton. 45.7 %stands for the mark of percentage meter, or called wresting square.The mark of the percentage meter between 20% and 90% is regarded asnormal figures. The viscosity meter will alarm if it beyond thisfigures. As result, the user will change the rotating speed androtor. 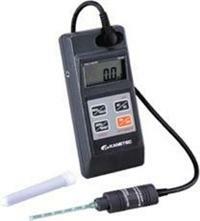 （1） As per 4 installation, install the viscosity meter in place. Theselection of SNB Series Product: Once pressing the key for thespeed, 60 or 60.0 will be displayed on the screen and flickering“6”.At this time, you can press the key for number going up orgoing down to set the tens digit of the rotating speed. And thenpress the key shifting rightwards to set the tens digit of theshifted number or decimal point. If the shift is needed in reversedirection, press the key shifting leftwards. In this way, you canset the value of other digit. Press the key for confirmation whenthe setting is over. （7） By revolving the knob of the ascending and failing rack, theviscosity meter will go down slowly and the rotor will immerge intothe liquid that will be measured until the mark of the rotor is inthe same level with the liquid. And then adjust the position of theviscosity meter to thelevel. （8） By pressing the key for measurement, you can measure the viscousvalue of the rotor under the current rotating speed and mark of thepercentage meter at the same time. （9） In the course of measurement, if you need to change the rotor, youcan press the key for reset directly. At this moment, the motorstops and the viscosity meter is still powered. After the rotor ischanged, you can continue to measure as per the procedures （6）and（8）above mentioned. a. Firstly, you should select the time intervalfor printing. After press the key for printing, S：00：05 willbe displayed on the screen. The time interval for printing will bechanged once you press the key for printing.00：05→00：10→00：20→00：30→01：00→01：30→02：00→05：00→ will be displayedon the screen to and fro. S：00：05 stands forprinting every 5 seconds, 00：10 stands for printing every 10seconds, ……05：00 stands for printing every 5 seconds. The restresult can be known by this way. When the time interval for printing on thescreen is desired, the selection of the time interval for printingis over. 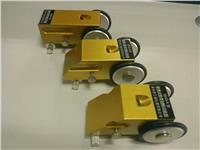 For SNB Series Product, you should press the key forprinting again for final confirmation. (1) The General Principle for Measurement:For the sample with high viscosity, you should choose the littledimensioned rotor ( No.3, No.4) and slow rotating speed. 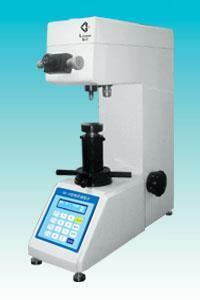 For thesample with low viscosity, you should choose the large dimensionedrotor ( No.1,No.2) and fast rotating speed. When measured ,the markmeasured by the percentage meter between 20% and 90% is the normalvalue. The viscous value measured within this range is the correctvalue. 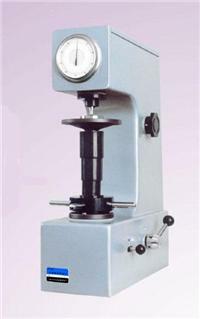 (3) Whenyou can not estimate the viscosity of the sample to be measured,you should decide on the rationality of the rotor and the rotatingspeed as per the mark of the percentage meter (wresting square).Themark of the percentage meter between 20％—90％ is the normal value.If the value is not beyond this limit, the viscosity meter willalarm, reminding the user to change the rotating speed and rotor.Never forget to change the rotor as per the principle that therotor is changed with changing the number of the rotor SP. （1） Becareful in installing and uninstalling the rotor. When installedand uninstalled, you should operate by uplifting the joint boltslightly. Do not do it more forcibly. Do not make the rotorreceiving the force horizontally to prevent the rotor from beingbended. （5）Afterchanging the rotor, you should input the new number of the rotor.The rotor that is used and changed should be cleaned first and thenput on the rack of the rotor. Do not leave the rotor on the meterand clean it. （6）Whenthe liquid is changed, you should clean (wipe up) the rotor and theprotective frame of the rotor to avoid the error caused by theinterblended liquid for measurement. （8）Donot dismantle and adjust the spare parts in the viscosity meterwith liberty. 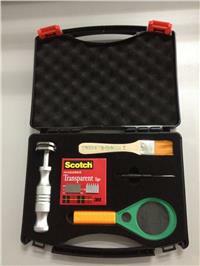 （9）Whenthe viscosity meter is moved and transported, the yellow cap shouldbe on the joint screw and the bolt should be screwed down andpacked in the box. （10）After the rotor is installed, you do not circumrotate it for alonger in case of no liquid to prevent it from being damaged. （11）Thesuspended and confused liquid, high polymer and the other morecondensed liquid have a lot of “ non Newton liquid”. Their viscousvalues are varied with the shear speed and the time. Therefore,their checking results under the different rotors and rotatingspeed are different. This is the normal case. It is not the errorcaused by the meter. Normally, you should regulate the rotor,rotating speed and time to measure the non Newton liquid. f． You should turn off the apparatus at time when the measurement athigh speed is changed into the measurement at low speed at one orkeep a less longer time at the low speed to overcome the error thatmay be caused by the circumvolved inertia of the liquid. g． Whenmeasuring the low viscosity, No.1 of the rotor is chosen, and No. 4of the rotor for the high viscosity. 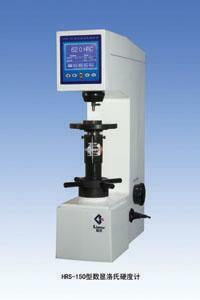 h． Themeasure time for the viscosity measured at low speed is relativelylonger. i． The viscosity meter can be replaced by revolving the ascending andfailing collet when you need to change the rotor and liquid to bemeasure in process of the measurement.